Crescent Cemetery is located east of Colorado Springs. Proceed east on Highway 94 for 28 miles; about one mile before the town of Rush, turn south on Whittemore Road and drive five miles to Trogilo Road. The cemetery is located on the southwest corner and the entrance is from Trogilo Road. According to GPS-derived geolocation (accurate to within 10 meters), the cemetery's coordinates are latitude 38°46'00.8"N and longitude 104°06'37.3"W.
John Hitchcock donated the land for the cemetery in 1908 or 1909. The first burial was that of Mr. M.J. Eichman in 1910. During World War I scarlet fever raged in El Paso County and many children were lost, including several buried in this cemetery. Many died within a few days of each other and markers and names weren't recorded. The cemetery is located on a gentle east/west slope from which Pikes Peak can be seen to the west. To the northeast and south are rolling plains. The local 4-H Club has provided concrete markers for the early pioneers who had no marker. The club also repairs the cemetery fence and mows the grounds annually. There are no established hours of visitation, but dawn to dusk is reasonable. Visitors should watch for rattlesnakes during summer months. 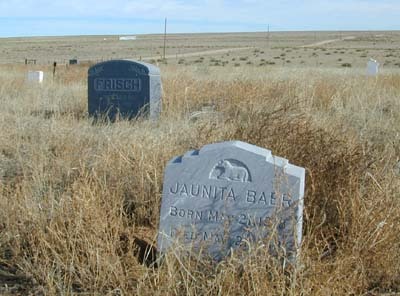 The cemetery was first extracted by Athlyn Luzier in 1971 and published in the Colorado Genealogist, volume 34, page 32. Additional relationships are noted in her extraction.